Three Al-Jazeera journalists have been arrested for illegally flying a drone in Paris Wednesday, after unidentified drones flew over the Eiffel Tower and key Paris landmarks for a second night running. It’s further baffled French authorities who are investigating a spate of unidentified flying objects in the Paris skies at a time of high security across the country. The foreign nationals aged 70, 54 and 36 — who work for the Doha-based international broadcaster — were taken into custody Wednesday afternoon after police spotted a drone flying in the Bois de Boulogne woods in western Paris, said Paris prosecutors’ spokeswoman Agnes Thibault-Lecuivre. She said is was unclear what the trio were trying to accomplish. Officials with Qatar-based Al-Jazeera did not immediately respond to a request for comment Wednesday night. The journalists can be held for a maximum of 24 hours under French law. Flying drones without a license in France is illegal and carries a maximum one-year prison sentence and a 75,000 euros ($85,000) fine. The Al-Jazeera arrests come in the midst of a police investigation into a spate of mysterious drone sightings over the French capital, including on Monday and Tuesday nights. Police sighted one or more drones in five instances buzzing in the Paris sky in the night of Tuesday to Wednesday — from 11.30 p.m. to 2 a.m.
An unidentified flying object was first seen Tuesday night near the Gare de l’Est train station, with sightings continuing in sequence for over two hours over the Paris Opera, then on to the Tuileries gardens, past the Eiffel Tower and then south past Paris’ Montparnasse Tower, according to Thibault-Lecuivre. An inquiry was launched after drones, which are banned over Paris, were also spotted Monday night — including over the U.S. Embassy. It’s not known who was behind the flights, how many objects there were in total, and even whether they were all coordinated. Last month a drone caused worry after being sighted flying over the Elysee Palace, the residence of President Francois Hollande — following dozens of sightings of drones over nuclear plants and military installations. These latest episodes are sparking particular concern, with Paris already on its highest-alert after January’s deadly terrorist attacks by Islamic radicals. French authorities have said the drones currently present no threat, apart from the risk of falling on someone, but the government is trying to find ways to counteract the devices. 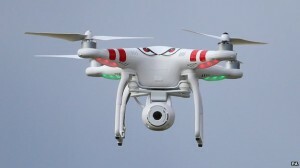 Some fear the drones could be spying on technology or could one day be equipped with weapons. Drone operator Jean-Luc Fournier, who has consulted on French drone legislation, said authorized operators condemn such rogue flights because it casts the whole industry in a bad light. A small drone crashed on the White House lawn last month, raising U.S. concern about the phenomenon.